Numbers are everywhere! My kids love finding numbers in books, on buildings, and around the house. My son came home from kindergarten the other day and wanted to show me how he wrote his numbers. We created a simple number game where he could practice writing numbers while my toddler could practice recognizing and matching numbers. Since Fall is fast approaching, we decided to write numbers 0-10 on some paper leaves and create Fall inside our house! My kiddos never stop moving... so they came up with a fun way that they could move around a lot while still learning. Before we started playing the game, we had to get a few things ready. First my son and I cut out several leaves from colored cardstock. Then he numbered each leaf with a number 0-10. He used an adorable number mini-book he made in kindergarten to help remind him how to form each number. Next I drew a large tree on a piece of easel paper and I wrote numbers 0-10 where the branches should've been. After we were all set up, it was time to play our movement game! For the Fall leaf number hunt, the kids took turns hiding the numbered leaves all over the downstairs. They especially loved hiding them in sneaky places like shoes. Once they found all of the numbered leaves, they brought them back to the number tree and tried to match them to the correct number... while saying the number aloud too. After they matched the leaves... they started throwing them! I decided to embrace that idea since throwing and catching is really a great hand-eye coordination skills activity. The kids threw the leaves up in the air and then tried to catch them and say the number(s) that they had caught! Once all of the leaves had fallen everywhere then I would say something like, "go find the 4" and they'd run to find the number 4... and then we'd repeat that with another number. As they found the numbered leaves they would match them to the tree and fill it up till it was full... and then we'd play again! 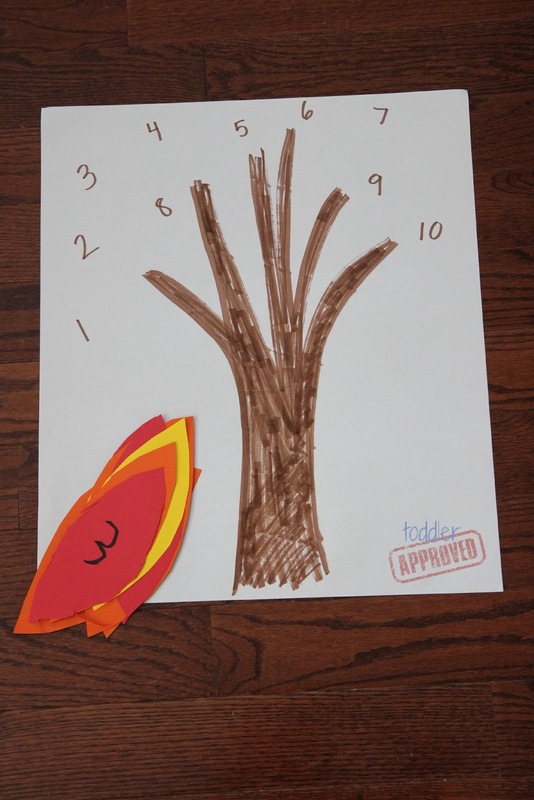 This Fall Leaf Number Movement Game is part of the Move and Learn Series that I am joining along with Hands On: As We Grow, The Pleasantest Thing, and Coffee Cups and Crayons. I am a huge advocate of getting up and MOVING while you are learning instead of just sitting doing only pen and paper tasks or flashcards. Brains make so many connections when learning happens along with doing movement activities. 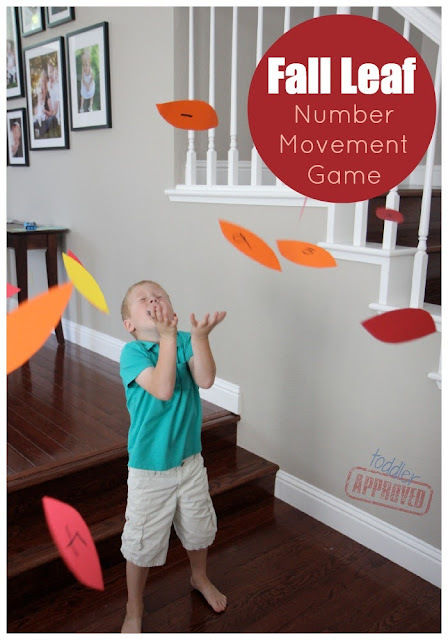 This game was a simple and fun way to sneak in a little number writing practice, number recognition, counting, and number matching... along with working on hand-eye coordination and throwing... and a few other motor skills. You can also check out our Move and Learn Pinterest Board for more inspiration! This activity is AMAZING! Thank you for sharing! I am going to pass it along via twitter and FB and give it a try with my 4 year old guy tomorrow!!!! love this ! so amazing !